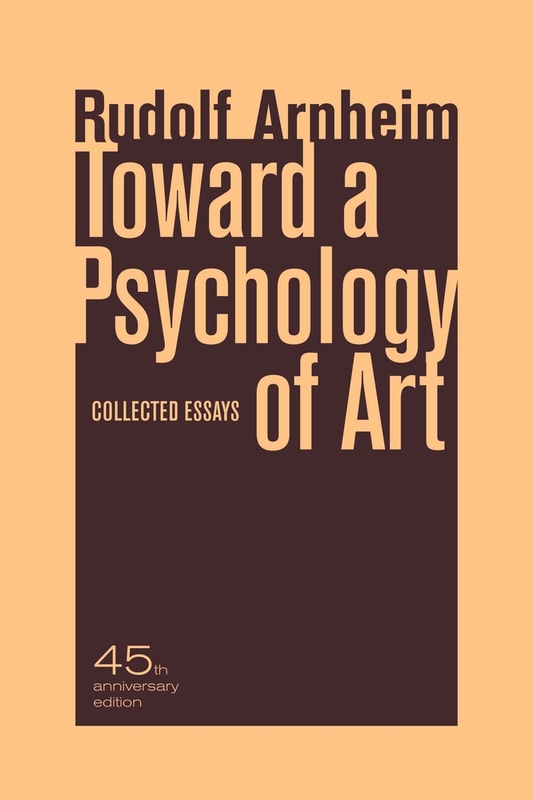 The papers collected in this book are based on the assumption that art, as any other activity of the mind, is subject to psychology, accessible to understanding, and needed for any comprehensive survey of mental functioning. The author believes, furthermore, that the science of psychology is not limited to measurements under controlled laboratory conditions, but must comprise all attempts to obtain generalizations by means of facts as thoroughly established and concepts as well defined as the investigated situation permits. Therefore the psychological findings offered or referred to in these papers range all the way from experiments in the perception of shape or observations on the art work of children to broad deliberations on the nature of images or of inspiration and contemplation. It is also assumed that every area of general psychology calls for applications to art. The study of perception applies to the effects of shape, color, movement, and expression in the visual arts. Motivation raises the question of what needs are fulfilled by the production and reception of art. The psychology of the normal and the disturbed personality searches the work of art for manifestations of individual attitudes. And social psychology relates the artist and his contribution to his fellow men. A systematic book on the psychology of art would have to survey relevant work in all of these areas. My papers undertake nothing of the kind. They are due to one man's outlook and interest, and they report on whatever happened to occur to him. They are presented together because they turn out to be concerned with a limited number of common themes. Often, but unintentionally, a hint in one paper is expanded to full exposition in another, and different applications of one and the same concept are found in different papers. I can only hope that the many overlappings will act as unifying reinforcements rather than as repetitions. These papers represent much of the output of the quarter of a century during which I have been privileged to live, study, and teach in the United States. To me, they are not so much the steps of a development as the gradual spelling-out of a position. For this reason, I have grouped them systematically, not chronologically. For the same reason, I did not hesitate to change the words I wrote years ago wherever I thought I could clarify their meaning. Removed from my original intimacy with the content, I approached the text as an unprepared reader, and when I stumbled, I tried to repair the road. In some instances, I recast whole sections, not in order to bring them up to date, but in the hope of saying better what I meant at the time. Some of the earlier papers led to my book, Art and Visual Perception, which was written in 1951 and first published in 1954- Sections of the articles on perceptual abstraction, on the Gestalt theory of expression, and on Henry Moore are incorporated in that book. Others continued where the book left off, for instance, the attempts to describe more explicitly the symbolism conveyed by visual form. The short piece on inspiration provided the substance for the introductory chapter on creativity in my more recent book, Picasso's Guernica. Finally, in rereading the material, I was surprised to find how many passages point to what is shaping up as my next task, namely, a presentation of visual thinking as the common and necessary way of productive problem solving in any human activity. Ten of the papers in this book were first published in the Journal of Aesthetics and Art Criticism. To mention this is to express my indebtedness to the only scholarly periodical in the United States devoted to the theory of art. In particular, Thomas Munro, its first editor, showed a great trust in the contribution of psychology. He made me feel at home among the philosophers, art historians, and literary critics whose lively propositions inhabit the hostel he founded and sustained. To him, as well as to my friends of the University of California Press, who are now publishing my fourth book, I wish to say that much of what I thought about in these years might not have been cast into final writing, had it not been for their sympathy, which encouraged the novice and keeps a critical eye on the more self-assured pro. There are a few scientific papers here, originally written for psychological journals but free, I hope, of the terminological incrustation that would hide their meaning from sight. There are essays for the educated friend of the arts. And there are speeches, intended to suggest practical consequences for art education, for the concerns of the artist, and for the function of art in our time. These public lectures are hardly the products of a missionary temperament. In fact, I marveled why anybody would go to a theorist for counsel, illumination, and reassurance in practical matters. However, when I responded to such requests I noticed, bewildered and delighted, that some of my findings pointed to tangible applications, which were taken to be useful. Rudolf Arnheim (1904-2007) was Professor Emeritus of the Psychology of Art at Harvard University and Professor Emeritus of Psychology at Sarah Lawrence College. He was author of many books, including Art and Visual Perception, Film as Art, Power of the Center, and Visual Thinking.